Transport your mind, body, and soul to the great plains of North America and immerse yourself in the historic and simplistic Native American cultures and traditions. 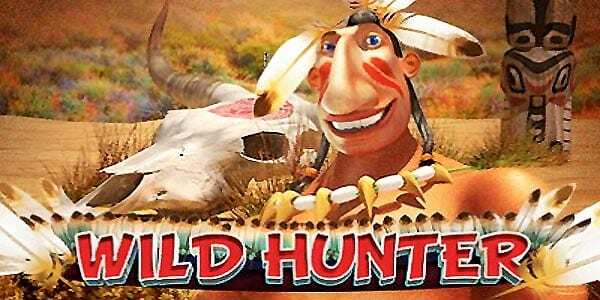 Wild Hunter is a beautifully animated 5 reel casino slots on the internet game where you will be guided by the wise Native American and his heard of roaming buffalo. Match soaring bald eagles and tepee huts to win some cash prizes and free spin bonuses. Only established in 2012, you might think that Playson is a small fish in a big pond but since then they have given the online gaming industry a boost of energy. This fresh-faced development company already has 30 high-definition online slot games with many more in the pipeline. Their creativity knows no bounds and their games are packed with stunning themes and innovative technology. You can learn about UK games of slots created by Playson. Have you ever wanted to give up your day job and become a Wild Hunter? Or maybe you would just like a little break from the normal day-to-day and go on a prairie adventure. Either way, Wild Hunter from Playson will take you on an amusing journey through the American prairies guided by a tomahawk-armed Native American Brave called White Feather. This online slot machine has 5 reels, 3 rows and 9 paylines and you can place your bet at 9p a spin up to £45 a spin. So get ready to experience some of the best video slots to play, like this game! Keeping to its Native American theme, you’ll see plenty of iconic artefacts such as bald eagles, tepees, drums and tomahawks. White Feather himself is to the left of the reels and as you will find out he is quite animated giving this game a great sense of fun. White Feather himself is the Wild symbol for this game, he will substitute any symbol on the reels except the Scatters. If you get 5 or more Wild symbols on an active payline White Feather will reward you with an impressive 5,000x your stake! 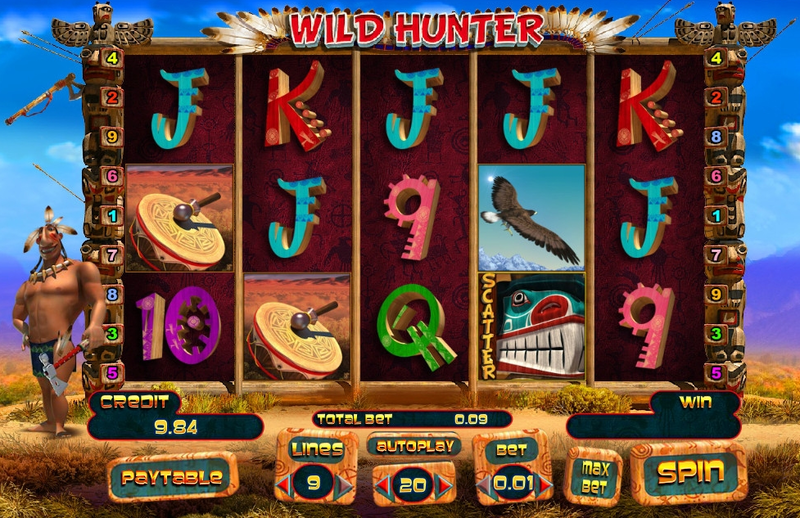 In this online slot game, there are 3 different Scatter symbols, the tomahawk, a totem and a buffalo. To trigger the Free Spins feature you will need to get a tomahawk on reel 1 and a buffalo on reel 5. You’ll be rewarded with 10 Free Spins, White Feather will chase a buffalo across the reels throwing a tomahawk across the reels, only stopping if it reaches the edge or is stopped by the skull. When the tomahawk does this it acts like a Wild replacing symbols to help you create winning combinations. When it’s adjacent to the Eagle symbol it will trigger a random multiplier ranging from 2x to 50x your bet! If your luck is in you could be in for some impressive cash prizes with this impressive feature. In addition to all this action, after each successful spin, White Feather will offer you a feather inviting you to play a traditional double-or-nothing card game with him. If you agree, White Feather will deal 5 cards and turns his one over. You have to find the card which is higher in value to his if you do your stake will be doubled. If it’s lower, White Feather will take your prize. The 3D graphics animations bring a lot of fun and amusement to this online slot game, setting it apart from the rest. Completing the theme with beating drums and crazy antics this game will keep you smiling. If that wasn’t enough to get you in the mood for a wild adventure this game comes with impressive game features which means you could be in for an impressive jackpot. So come and join White Feather, after all, he can’t get all those buffalos by himself.